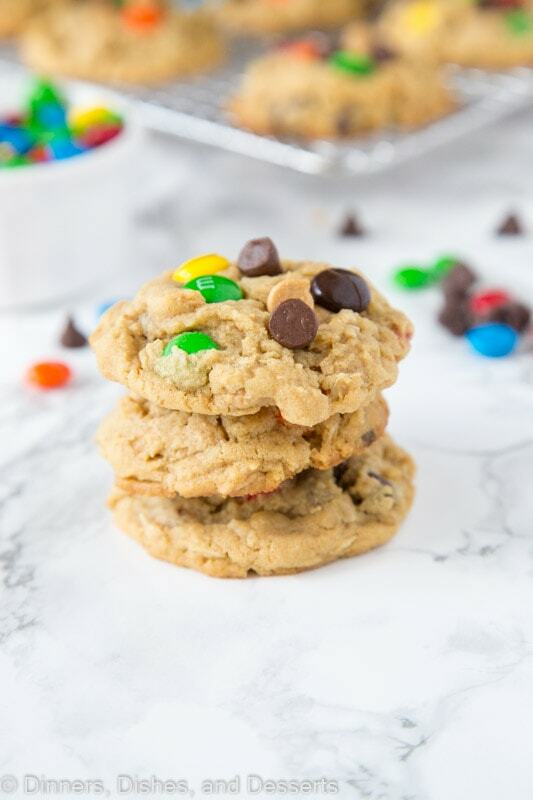 Soft Monster Cookies – a soft and chewy cookie that is a cross between a peanut butter cookie, an oatmeal cookie, and a chocolate chip cookie! Full of lots of goodies everyone loves them! 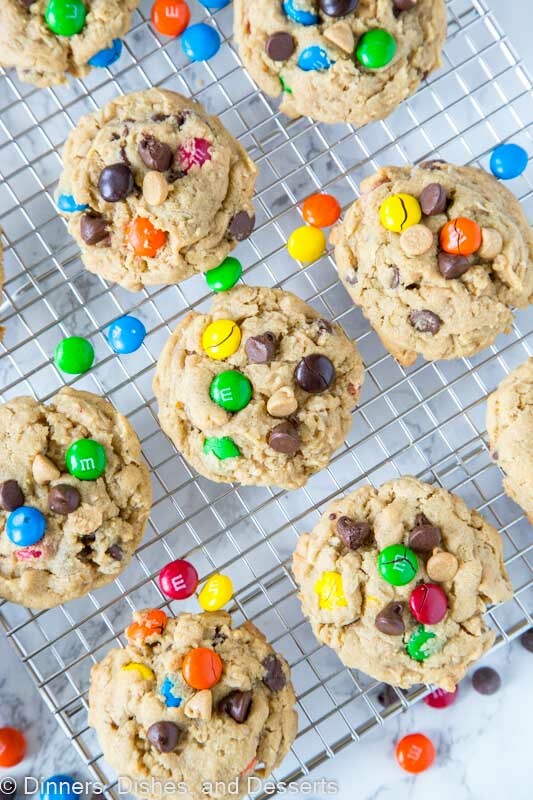 Cookies that are full of peanut butter, oats, peanut butter chips, chocolate chips, and M&M’s sound pretty much like a dream. Well that is exactly what these monster cookies are, and they are just as decadent and delicious as they sound. 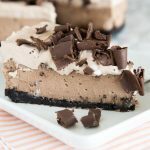 I shared these No Bake Monster Cookie Bars a couple of years ago and they are still very popular. And it is no surprise why! 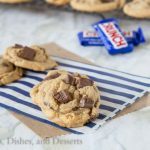 Those are ready in just minutes and have all the same flavor as your classic monster cookie. You can even get all the same flavors in a quick snack too! 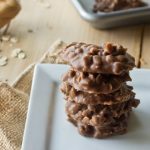 Check out these No Bake Monster Cookie Energy Bites. We are kind of chocolate and peanut butter fans around here. 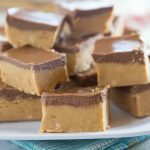 Reese’s fudge is essential around here, and not just during the holidays. I grew up having cookie dough in our freezer at all times. 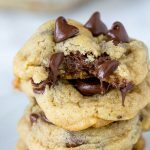 My mom would make our favorite chocolate chip cookie dough and have it in the freezer, so we could make cookies any night of the week. Which is what I love to still do today. And these monster cookies are the perfect thing to freeze and have waiting for you, if you don’t want to bake the full batch at once. These are super soft and tender, just the way I like my cookies. The edges set up and the centers stay nice and soft. 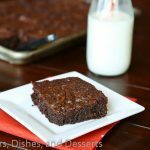 I am always about the easy way when it comes to baking, cookie bars are one of my favorites to make. Chill the dough. 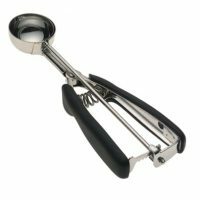 Not all recipes suggest this, and it isn’t always necessary to make good cookies. BUT it never hurts. 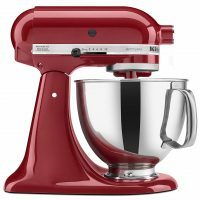 It just sets up the dough so they don’t spread as much and leads to a thick and chewy cookie. Don’t over bake your cookies. If you want your cookies to be soft, you can’t bake them until they are 100% done in the oven. You need to take them out early. 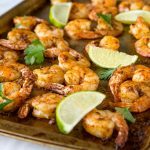 They will continue to cook on the baking sheet and be the perfect texture. 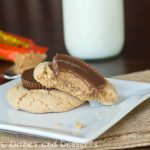 Monster cookies are full of peanut butter and oats. 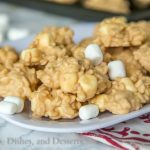 In this monster cookie recipe I used old fashioned oats, because I want the texture of the full oat. 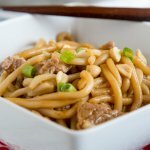 You can use quick cooking if that is all you have, but they will be slightly different. Now all the chips! 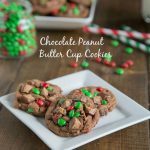 These cookies have chocolate chips, peanut butter chips, and M&M’s! All the good stuff, right? Don’t skimp on them, these cookies are meant to be loaded. To make them extra pretty you can top with a few additional chips after they are on the baking tray. That way when they come out of the oven they are picture perfect. These cookies are perfect for the freezer. 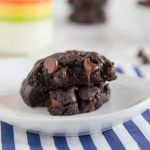 You can bake the full batch and put them in an air tight container to store them in the freezer if you want. You can also scoop balls of dough onto a baking sheet and put in the freezer for a couple hours. Once the dough is frozen, put them in a freezer bag for storage. 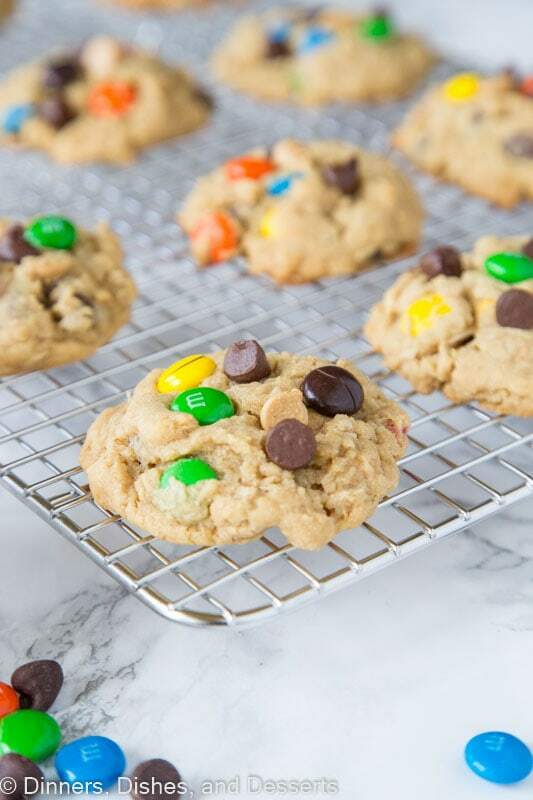 Then you can bake a fresh monster cookie whenever your cravings strike. 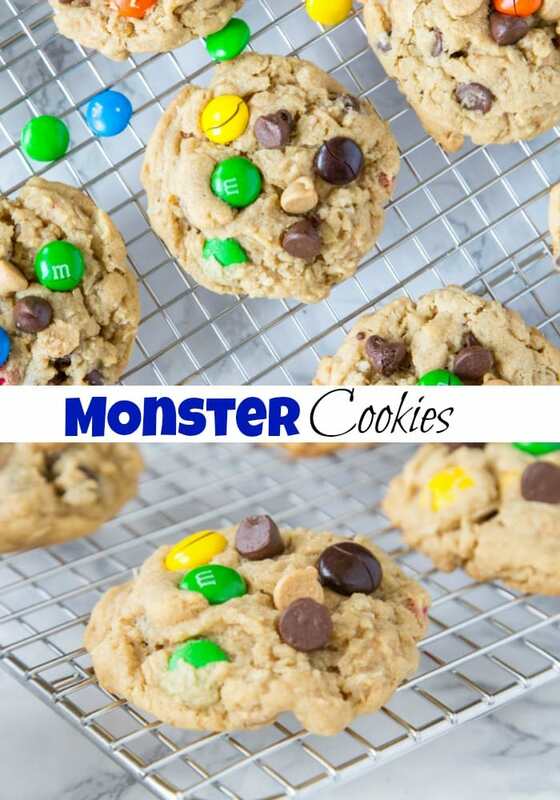 Bake up a batch of these monster cookies today and remember what it is like to be a kid again! These bring back lots of memories from having them at friends house when I was a kid. 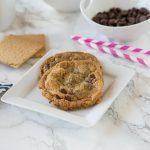 Soft Monster Cookies - a soft and chewy cookie that is a cross between a peanut butter cookie, an oatmeal cookie, and a chocolate chip cookie! Full of lots of goodies everyone loves them! In an electric mixer cream together butter, peanut butter, brown sugar, and granulated sugar until light and fluffy. Add egg, egg yolk and vanilla and mix until well blended. Mix in oats, flour, baking soda and salt until the dough comes together and there are no streaks of flour. 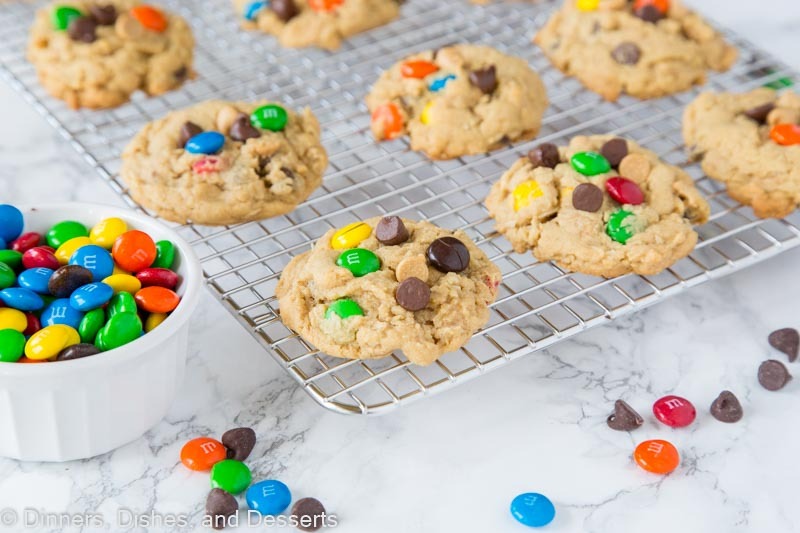 Fold in peanut butter chips, chocolate chips and M&M"s.
Scoop balls of dough onto baking sheet. Bake for 9-10 minutes until the edges are just set. 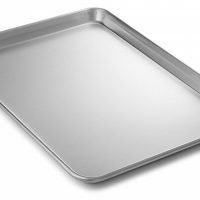 Remove from oven and let set for 5 minutes before removing to a wire rack to cool completely. For best results chill the dough for 30 minutes before baking. Seriously I want all of these cookies!!! Loving all the chips…the more the merrier!! Such a great snack! Oh, this cookie is so sweet! My whole family would go crazy for these! 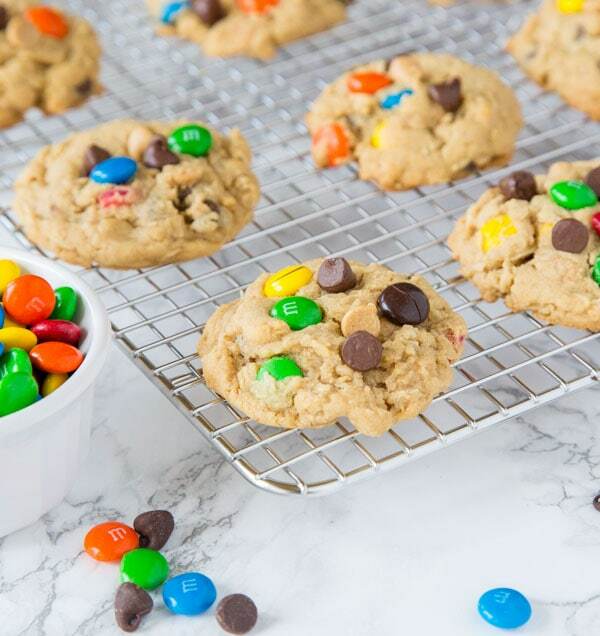 These monster cookies will disappear in no time here! So fun to make and eat! I love soft cookies! And then the candy and chocolate chips just sends them over the top! 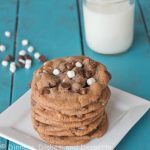 These cookies are so soft, chewy, and delicious! And hello FUN for Halloween! These look so addicting. 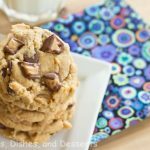 I love monster cookies and these look pillowy soft. Yum!! My favorite! I love that they have a little bit of everything!